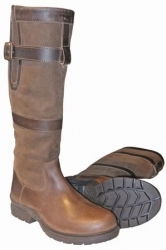 These stylish country boots will look great either at the yard or out and about. They are made from soft nubuck and calf leather outer with a waterproof Viltex membrane lining. They have a sturdy rubber sole and feature an adjustable side buckle gusset. The Tall Vision Boots are available in sizes EU37 - EU42 in standard calf width only.